As one gets older, different activities from different times of one's life seem to merge together. I always like making things, and discovering how to make things. 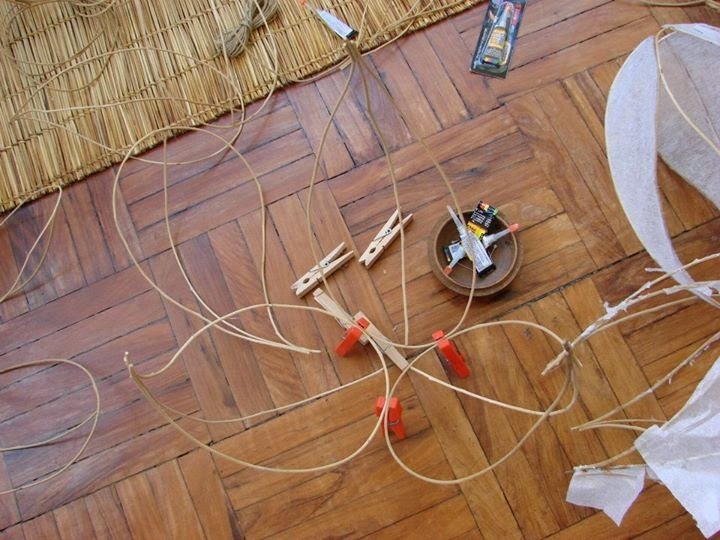 When I was small, I hacked some sisal plants and spent the next few hours hitting it with a rock. I might have been bored, or perhaps I was trying out the science of extracting fibers from the thick leaves. I don't know, I was only seven. And my parents let me play with knives but I managed to not cut myself too severely, so I grew up to be a physically complete adult. When I got my first camera, I enjoyed taking landscape photos, but what began to intrigue me more were the little things. First flowers- not the roses- the tiny ones- the ones we walk over or just pass by because we can't see them immediately. Then insects- they were far more challenging- they moved, hid, and you had to take about a million photos to get the one perfect shot. It's one of my favourite hobbies, but one, alas, that I don't get to do so often. For me, it's an activity that's best done out in nature, where nobody else is around me, asking questions or breathing heavily. I recently started setting up my metal-smithing gear again- on a tiny space, just a desk - with the soldering torch, the various pliers, the bench pin, the saw, the mini-drill, etc. I've made plants and flowers before, back when I was a student and it was fun. Flowers are nice to look at, and pretty much everyone likes them. The flowers I looked at and took pictures of, however, weren't pristine, and it was often the insects that I was interested in. And so, the flowers have evolved from "just flowers" to recognisable plants- ground sorrel, Jacob's ladder, etc. What I'm happy with is the evolution of what's I'm doing- that it's continuing, and perhaps many other aspects of my life will merge into it. On the second or third day at what was then my new work place, someone stole my scissors. I was distraught. They were hot pink, my scissors. Hot pink, Friskars, and they cost me 19 dollars at a Michael's in Houston, Texas. I'd had my name clearly written on them too. Minati. Which is an archaic, Sanskritic name that only women over the age of 80 seem to have anymore. I searched high and low, and even the sweet receptionist came with me to every floor and department to ask about the said missing scissors. I even told the HR guy to just pass around the message that I don't care who stole it, or why they stole it- that I'd just really appreciate if they would just put my scissors back on my desk. Yes, I was making a mountain out of a pair of scissors (though, to be fair to myself, 19 American dollars is a good amount in Indian rupees, and they were the most comfortable pair of scissors I ever beheld), but the point was, I liked my place of work. I liked my new bosses and I liked my new colleagues and co-workers. I just wanted to think the best of my new work place. And that's why I wanted my pair of scissors to be returned- so that I could keep thinking the best of people. My scissors were never returned, though they were replaced by a much cheaper pair which were not hot pink or too comfortable to hold. But they did the job well enough to produce all the work below. I was, also, now known as the scissor lady. I don't think anyone wants to be known as the scissor lady. Anyway, though I am still a wee bit bitter about my scissors, I managed to get by, managed to not dislike my work place- I even enjoyed the work. One of the projects that I have been focusing on is lighting. I had previously done some work, mostly for myself, in this area. There's something comforting about about lighting- be it a candle when the electricity has been out in a third world country and you don't own a generator, or strings of fairy lights around a tree, or the harsh glow of florescent bulbs softened by sanded glass shades. The world is made up of what we see, and we make up what we don't see, or we partially see with the shadows of the light. I am, however, getting ahead of myself here. 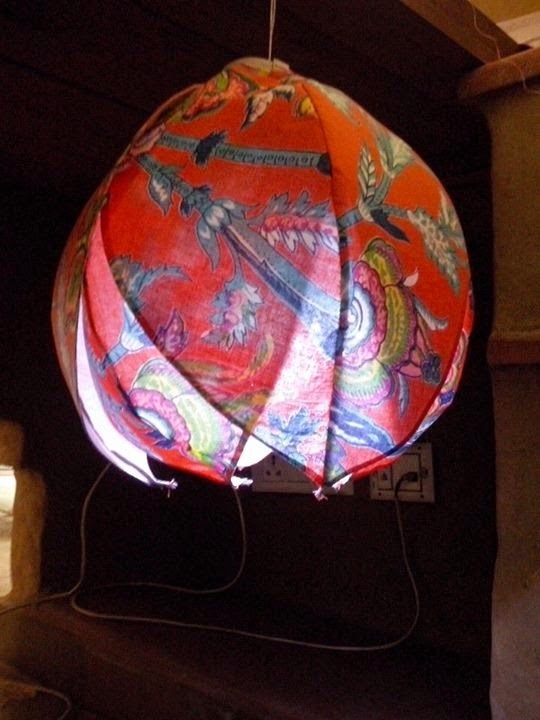 I started working on lampshades a few years ago, employing techniques one once learned in primary school- balloons, flour and newspapers and tissues. Then, on a work trip to Nampula, we sourced a variety of vine used locally for furniture, and I was in love- with the material. Wonderfully flexible and lightweight, I played around with concepts until I found its best friends - superglue and fusing fabric. Clothespins helped a great deal too. I made very few of these. Production usually stops being fun after the second or third piece, especially with the tedious process of individually marking and cutting out each section of petals. 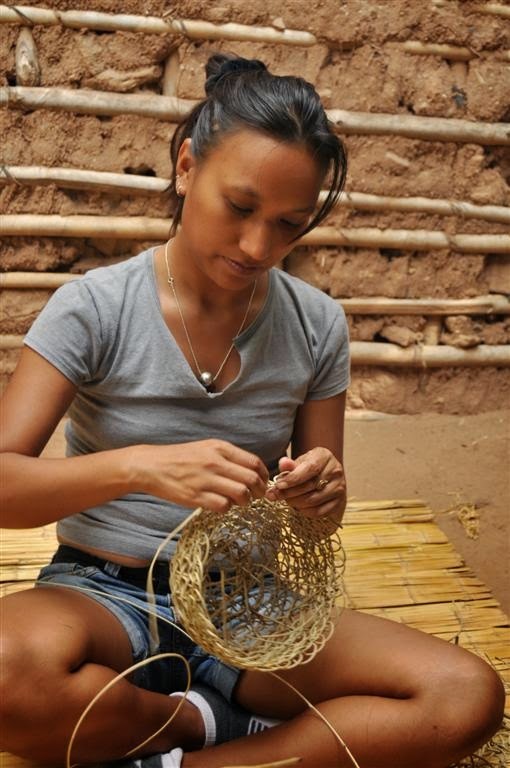 That's the thing with using natural materials-everything in nature, as with our own selves, has it own way of working, moving. Each petal, therefore, was different, no matter what steps I took to maintain consistency. 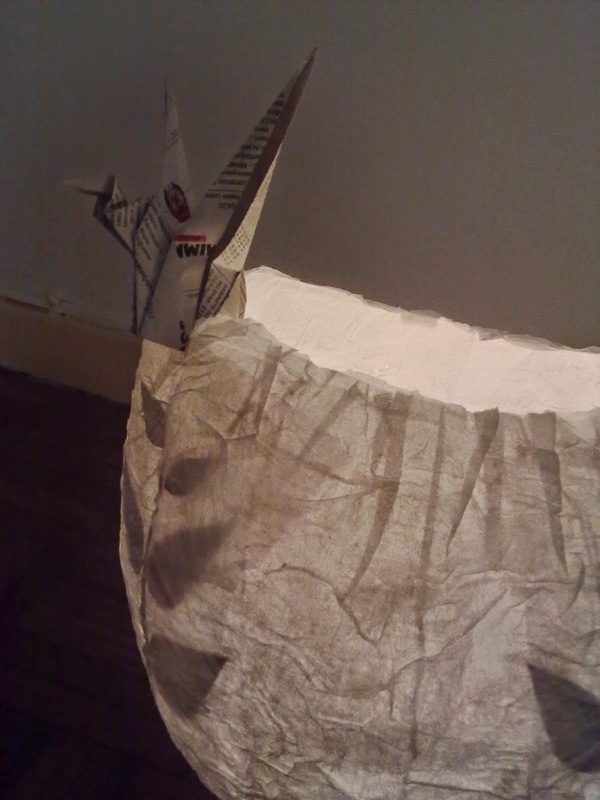 The result was incredibly lightweight and ethereal, and also very fragile. Superglue can only do so much. I tried employing similar techniques to the recent project. Context is, of course everything. The vine was from some small village in Nampula, Mozambique, and each lampshade took the attention of hours of my own labour, in the quiet comfort of my own living room. And thus I listened to the entire series of George R. R. Martin's Game of Thrones, Neil Gaiman's Neverwhere and Stardust, and Bill Bryson's A Short History of Nearly Everything. 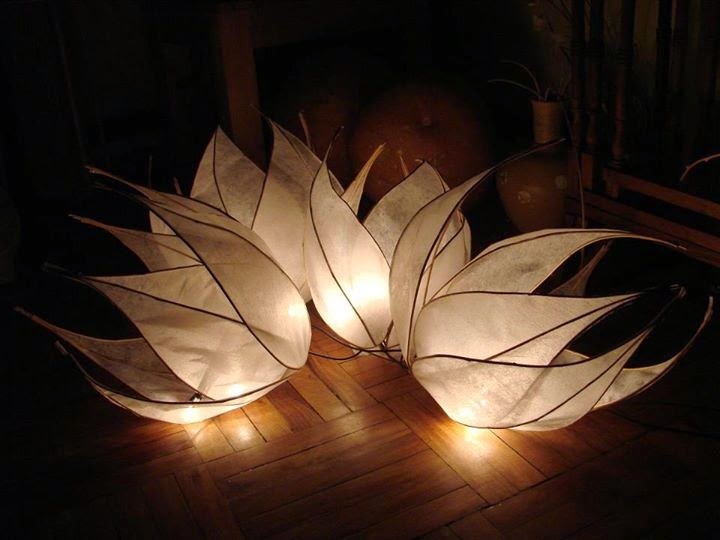 I made about 7 of the lampshades, and that was it. None of this, would, of course translate well in my current context: India, Factory, Mass production. I would have to use different materials, techniques. Still, a challenge is a challenge, and I was up for it. I tried maintaining the same shape, but when you base something on the basic structure of a material than came specifically from a certain part of a foreign country across the Indian ocean, it just doesn't work. The new product is about the product. The context is production. The methodology requires a need for easy replication and repetition, and an understanding that it is, all in all, just a product. I had some fun with the prototyping, though. That is when the work is truly mine. The hours of calculations, the cutting, the figuring out of which process comes before or after what. I did, a couple of times, bring the work home. Spent hours sewing in contemplative silence. It was a different time, different place, different context. The work would no longer be mine - other people would eventually do the marking, cutting, sewing. One of the things that I'm realising is that it is hard to let go. It is hard to watch other people make mistakes on a product that you worked so many hours on. You simplify the process, you recreate, you redesign- so that other people can make them with fewer mistakes than you yourself did. It is hard to let go when the processes keep changing in your head, because you want it to keep evolving until it has reached its perfect stage. I guess this has become some sort of a metaphor on letting things go. On letting unfinished dreams go. On letting unfinished ideas go. Let one dream go so that another can form, and maybe that will have a better chance of becoming reality. Let an idea go because that is what is letting process and progress stagnate. So I've let my scissors go. I hope whoever is using it is enjoying its hot pinkness and its smooth cut. My name is permanently Sharpie marked on it though, so that the person who took it will always know that it once belonged to someone named Minati. I still like the people I've worked with, and, recently a colleague informed me that I'm now referred as the lady who makes the lights. That title itself is worth losing a pair of scissors for. I haven't lived in India as an adult before. In fact, I've spent almost all of my life outside of my native country and I've always hated the idea of living here. I've always hated the crowds, the pollution, the dirt, the traffic, the lack of elbow space, the nosy neighbours, Holi, etc. But providence - because it's always so much easier to blame it on providence, finally brought me back, and reminded me of an entry I made in my journal some years ago- that I had, for better or worse, decided that I should be in India for time time- mainly to be closer to my father and try to re-establish some familial roots. The difficult part of my transition- leaving Mozambique - a place that I had considered my home for almost 10 years, was over, thanks to my stint at the Sitka Center of Art and Ecology. I needed to leave, and Sitka had provided me with a place for that transition. Standing at the top of the Cascade Head, overlooking the Pacific Ocean, I knew that that I was where I wanted to be, right there and then. And the future itself was a blank slate. I had no plans. And so I ended up back in India- Delhi in particular. I had lived in Delhi before, during my college years, at that cusp of adulthood when I was most uncomfortable with myself, with my life, with the world. And now I was back, more than a decade later, to a different Delhi. I'd even venture to say a cleaner and better Delhi. I've even found people to be fairly nice, and decent. But perhaps that is because I, myself, am a nicer person than I used to be (or so I'd like to think). I still have no plans, by the way. Anyway, none of this self reflection is relevant because this journal is primarily visual. I've just recently come back from a wonderful trip to Dharamsala with a friend who has just had the "can do trips with" box checked on my list of friends. Let's start with the mountains. We were close to a very tiny part of the Himalayan mountain range. There is just something about sitting on a hill, and looking at even bigger formations, some so high that they're capped with snow. The majesty of it doesn't make one feel insignificant - it makes one feel like a part of something far grander than we can possibly imagine. Pee with a view. If you need to on the trail, one might as well enjoy the view, right? McLeod Ganj gets more than its fair share of visitors from all over, including the occasional Hare Krishna! Mantras for the road. You need 'em to drive through the treacherous, winding roads. Too many cars for so little road. Our mission in McLeod Ganj comprised of a visit to a world famous Tibetan doctor (whose specialty was determining the cure by looking at patients' urine) and more randomly, a visit to a tarot card reader, because why not? But first, to get an appointment with the aforementioned doctor, one has to stand in line to get a coupon. Because the appointment is virtually free (well, ₹10) and the old fossil can see "only" about 45 patients a day, there is a long queue to get the appointment. We stood (and sat) in line for about 5 hours - mind you, this is not counting the other 6 hours that one of our host's worker had been standing in place for us. The clinic is in a small, tight, dingy alley, that also serves all manner of beasts. samples in a cup. We wait for 45 minutes. like an assortment goat poop. At Norbulingka, which is kind of touristy. There was, of course, some socialisation. We were introduced to a lovely group of people that liked cooking and playing music. They were all adorable, and I had the best home made pizza ever. Thanks to Anton, Abhishek, Sena and KP! And Garfield! One of my favourite parts of the trip was, however, getting lost on a hike through the terraced hills, streams and forests. When we were feeling tired, lost and kind of faint, Providence introduced us to a kindly couple who offered us their chairs and cups of chai- of which they had just happened to brew exactly two cups extra that afternoon. Providence, for sure! A Special thanks to Kunal Singh for hosting myself and Maya for the week. We had a blast! A path that looks like it leads to the mountains. Eventually.